If you recall in my very first post - Five Key Benefits (you may never have thought of) From Hosting an Employee Health Fair - I hinted that there is free, online technology out there that will automate 95% of the planning process/headaches for you. This post is going to discuss this technology (aka HFC's platform) and show you that it would be flat out, not smart to plan your health fair without it - or pay a planning company to do it - or bog your benefits broker down with unnecessary tasks. Now I know what you might be thinking, "Kyle, there are third-party health fair companies all over the nation. How different can HFC really be?" ... I'm here to tell you that the HFC's platform is 10x different (not to mention, it's free) than anything else on the market - and you'll love your experience using our online, health fair dashboard. When HFC first started, we were one of those typical, third-party planning companies. We planned hundreds of health fairs by hand (meaning phone calls, email reminders, excel sheets, etc.). So, we took all that knowledge and experience and translated it into technology that will automate those headaches. The screenshot above is a picture of what your health fair dashboard will look like once you list your health fair (see: How To Get Started On HFC). It takes less than three minutes to create a profile, list your health fair, and gain access to your dashboard. From your dashboard overview, you can see the four main sections (pictured above) that will help you through the planning process from start to finish: Vendors, Invites, Messages, Downloads. That's right; those four main sections on your dashboard are going to take you through the planning process and save you 40-60hrs of work. I'm going to break down each feature/section so you can see how this works. And most importantly, so you know this is not too good to be true. 1. Vendors join an interested list for your health fair. Finding/securing vendors for your health fair used to be a major headache...now it takes a few clicks of a button. As you can see above, we collect the info from vendors for you to review, and then you can click the red "Approve" button or the "Not this time" button. The main point to take away is that you have full control over which vendors get to attend your health fair. Multiple groups have said it's like online shopping for health fair vendors. In all most all cases, you're going to have vendors you want to invite. This section is where you can invite those vendors that you personally have worked with in the past or your insurance carriers, EAP's (401)k, etc.. You can copy/paste them in or upload a .csv file. It's super easy. We make it easy and friction-free for those vendors you personally invite. They get an email with a link and boom, they are on your vendor list. And trust me, you want to get these vendors on your online registration list so that those vendors receive the reminder emails from the system and are in your logistics documents...we'll touch on that soon. As you can see above, there is another tab inside your "Invites" section called "Share your dashboard." This tab is where you can invite and give access to your team members and your benefits broker. And for you benefits pros that assist your groups with their health fair, you can use the "Share your dashboard" section to provide access to your HR contact and hand the keys over for them to run the show while you're still kept in the loop. Not to mention, the "Share your dashboard" section is ideal if you have multiple locations and are planning multiple health fairs. You can set up the dashboard for each location and invite your onsite HR contacts to each of their events. You'll be kept in the loop for all health fairs while your onsite contacts only see their location. We have seen multiple groups use the platform for locations nationwide and they love how easy it is to track and manage all of their health fairs from one place. The "Messages" section makes it easy to communicate mass messages containing that pertinent information you need to tell your vendors in regards to parking, arrival, setup, etc. (i.e. "don't forget your ID for security" or "no open-toed shoes on the manufacturing floor"). You can even upload an attachment if needed. As you can see in the screenshot above, the place to mass message your registered vendors is under the "Announcements" tab. The "Messages" tab is for individual messages between you and vendors. Refer to the screenshot under the "Vendors" tab, and you can see the blue "message" box. Once you directly message a vendor from the blue "message" box, the conversation is then tracked under the "Messages" section. 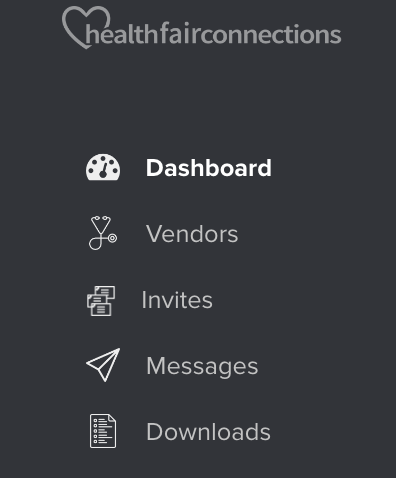 It's now super easy to communicate with your vendors! As you can in the screenshot above, this where you will go to download your graphic health fair flyer. No need to waste time crafting one! You can come in your "Downloads" section, make edits (add a tagline, add a logo, etc.) and download a PDF event flyer that you can print or email out to your employees. And just like that, you're off and running with creating employee awareness about your health fair. Now like all sections, there are multiple tabs under "Downloads." The other tab (pictured above) is for your logistics documents. The main document you'll find and download here is your vendor details sheet. We take all that information we collected from the vendors and put it on one sheet so that you can see the full picture of your health fair (info such as rep attending, rep cell #, electricity, raffle prize, special requests, screenings/offerings). You now can feel confident about your health fair as you know exactly what to expect the day of your event. The other main download is your vendor table tags. You'll want to download and print these table tags out. You can then lay them out prior to vendors arriving. Vendors come in, you point them to their table, and now you have made the setup process smooth and easy for you and your team. I'm making this a subheader under "Downloads" because on your vendor details sheet is where you can see if your vendors have received a reminder from HFC's system and re-confirmed to attend your health fair. Want to eliminate no-shows from your health fair? Vendors will receive a reminder email 7,5,3,1 days prior to your health fair (that's if they do not respond to the first reminder). Inside the email, there is an actual button they have to click to re-confirm their attendance. You can see if they clicked the button or not on the 2nd column of your vendor detail sheet. This truly reassures you that these vendors are going to show up, as you know that someone has physically received and clicked a reminder button. Not to mention, we're going to send a text message the morning of your health fair to all vendor reps attending. We have reminders covered for you! The main thing to take away from this post is how easy the dashboard makes it on you to plan your employee health fairs. Thank you for reading and please comment with any questions! And if you know of anyone about to plan an employee health fair, they'll love you for sharing HFC's platform with them. Want to dive deeper into HFC's platform? Click here to access our LinkedIn slide share that provides much more detail on HFC.